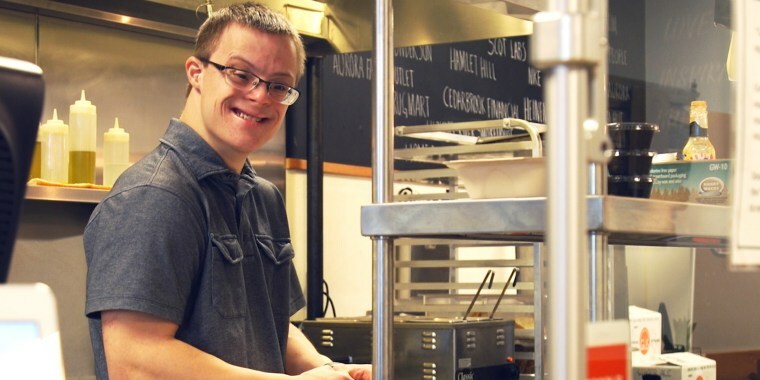 At Two Cafe & Boutique in Chagrin Falls, Ohio, people who have developmental and physical disabilities work alongside others in an integrated environment. That's Shari Hunter's mission at Two Cafe & Boutique in Chagrin Falls, Ohio, where people with disabilities work alongside their able-bodied counterparts in what she calls an "integrated workplace." Her one rule? People have names, not labels. It all started when her son Derek, now 24, was born with Down syndrome, and Hunter found herself thrust into the world of special education. "I was so concerned for Derek and for his future," Hunter said. "And mostly because I was afraid of what society thought, and I felt society didn't really provide equal opportunities and acceptance." She made a promise to herself then: "I will never label him and I will never limit him," she recalled. "I'm going to raise him just like I'm raising (my other children) Christian and Tiffany. We're just going to see what happens. We're going to see what he can do." As it turned out, she needn't worry. Today Derek is married and he and his wife both work, drive and have their own home. They talk about their dream of having a family — but first, a dog. Until recently, Derek helped train employees at Two Cafe, teaching them how to ring up orders and take care of customers. Now he has an administrative job at an office. His wife, Lauren Hunter, who also used to work at the cafe, recently started her own business making gift baskets. "I basically am doing my dream every day," she told TODAY. "And I just love doing that. The (Two Cafe) boutique has really helped me to grow my business." Hunter hopes that her employees, like Derek and Lauren, can take the skills they learn at Two Cafe and use them in future jobs. She trains them in customer service, food preparation and sales, and then helps them find out what they really want to do. "We write their resume," Hunter said. "We set up the interviews. We take them to the interviews. We have over 20 businesses that are hiring from us, and it ranges anywhere from a car dealership to offices to restaurants to stores." She’s placed dozens of employees — “grads,” as she calls them — at jobs in the Cleveland area, through her nonprofit, the Two Foundation, which works with local businesses. But Hunter doesn’t want her graduates to just get by. She wants them to flourish. "I tell all of (them), 'This is a competitive workforce. This is a competition. We don't want you to just be average. We want you to be better than everybody else,'" Hunter said. One of her employees, Nick Briggeman, 25, a cashier at Two Cafe, hopes to become a sign language interpreter and help the deaf community with retirement planning. Another employee, Hannah Peereboom, also 25, might stick around the Two Cafe longer, as she's expressed an interest in gardening and Hunter grows some of the cafe's produce at a farm nearby. Hunter will work with both of them to make sure they find jobs they love. Hunter is particularly interested in hiring individuals who recently graduated from high school or from sheltered workshops, government-run programs in which people with disabilities (or exceptionalities, as she calls them) work, often for less than minimum wage. But she doesn't believe segregated work sites are the solution. The world needs community-based employment. In other words, more places like Two Cafe. Even if, as Hunter has learned, that means letting them figure some things out on their own. "I tell parents all the time, 'Yeah, we love to put them in a bubble and protect them,'" she said. "But that is the worst thing we can do. Just let them go and make their choices and sometimes make their own mistakes. That's what it's about. That's life. That's parenting."